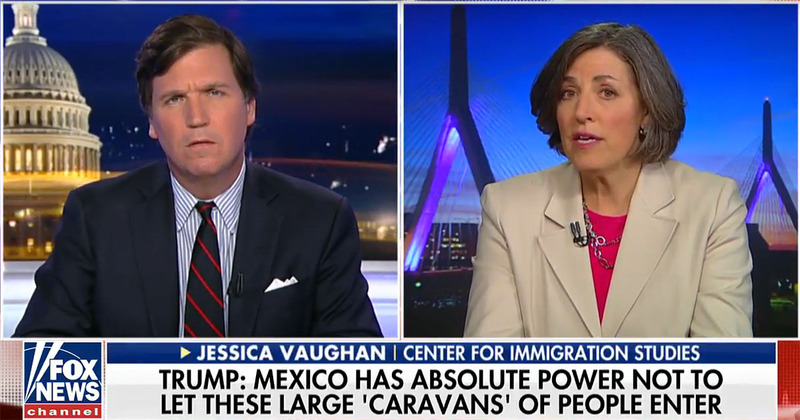 Tucker Carlson addressed the caravan of Central American peasants that are being ushered through Mexico on their way to attempt to demonstrate to the world that the United States can’t stop them and thus set into motion a mass invasion of perhaps hundreds of thousands of people across our unprotected southern border. He plays clips of the snooty open border leftists at CNN, one of which is a former Obama political appointee, mocking President Trump as they misrepresent what is going on to their intellectually challenged audience. Tucker translates their babble into plain English, saying, “Shut up, America. You have no right to complain.” Noting that since that is the left’s view it’s naturally CNN’s view. He asks if that is also America’s view, “Do voters think that we have a moral obligation to admit every single person from around the world anytime who wants to come here, feed and house and educate them at our expense, even as our own middle class dies? She says one option is to prevent them from getting to the United States, “do as we’ve done in the past and tell Mexico we want to come in and head this off before they get to our border.” She points out we have a lot of leverage with Mexico if anyone in our government cares to use it. Carlson asks about the use of the military to defend our border against this hostile act. Vaughan says it would be possible for the President to declare an immigration emergency that required extraordinary measures in response. Based on governance by tweets, and shinny objects, I think we will see a Mexico favored NAFTA and at least many of them accepted as asylum. We’ve been ping ponged for the better part of a year and while “this must stop, not good”, it keeps on going. IF we actually win on this I’d like to see if the issue is finally addressed, with troops, and the army core of engineers who still are nowhere to be seen. I think that real Americans believe this is a declaration of war issued by Mexico. We can and absolutely must build walls (including rolls of barbed wire and traps) and arm our border with military who are ready for war. What better place to use them than protecting our own borders. We have plenty of tanks and big guns to help enforce our border plus drones that can be used to target the leaders. If necessary we can start by putting Congress up front in the lines and use them as the first line of defense. I know they won’t do anything but then the military will have an even better excuse to start firing on the invaders when they run the Congressmen over. (one way to get rid of traitors to our country). I know that a lot of people would be more than happy to help protect our borders as we still have our Constitution’s 2nd Amendment and are very happy to use it for our defense. I am offended by all who claim to be patriots but are really out to destroy our great country. The time is now for all great men to come to the aid of their country! If they want to test the waters let them. Athletes a lot of people that need target practice. the 1ST MARINE DIVISION IS IN CAMP PENDLETON CALIFORNIA. if i were TRUMP ID USE THEM ASAP. and we have Army bases in Texas as well plus Trump can FEDERALIZE BOTH STATES NATIONAL GUARD UNITS ALSO. and i’d do just THAT, WITH ORDERS TO SHOOT ALL WHO TRY AND ENTER. 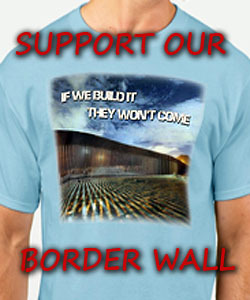 ENOUGH OF THE BS FROM MEXICO, and those Governors and OTHER TRAITORS, PLUS ALL COMMUNIST DEMORATS AND RINOS. this is an ATTEMPTED INVASION and can’t be looked at any other way. I say that’s what he’d better do or he’s going to have more than illegals to worry about, he’ll have some pissed off Trumpers on his hands too, James. Threatening Trump is a MAJOR mistake in my mind. He doesn’t take kindly at all to threats and it’s going to be interesting to see what he does with it. With Satellites, drones, informants, border cameras and other electronic devices, I see no way they will get across without getting shot by the private property owners who have also had enough of this BS!! !